Kayla Wooten competes at the 2018 NCAA Division II South Central Regional Nov. 17 in Denver. Photo by Susan Nofziger. 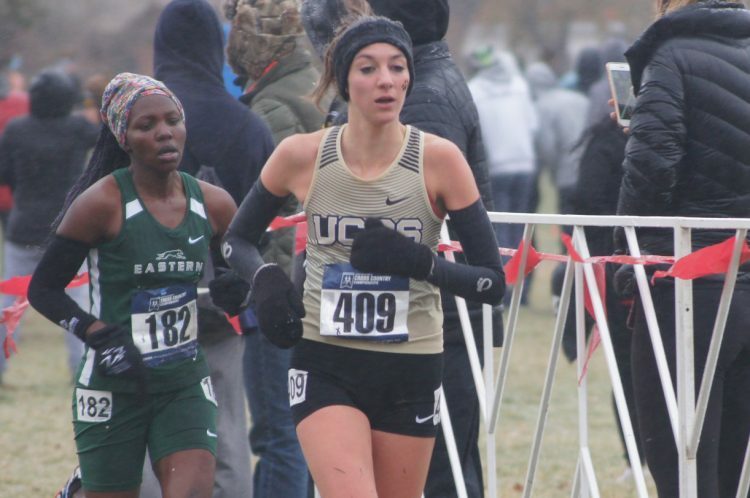 Junior Kayla Wooten led the UCCS cross country teams with an eighth-place national finish in the women’s race as the Mountain Lion men’s and women’s cross country teams placed in the top 15 at the 2018 NCAA Division II Cross Country Championships in Pittsburgh. Wooten finished the six-kilometer race in 22 minutes, 51.2 seconds in her second cross country All-America performance and fifth overall. It’s the second-best individual performance for a runner in program history, behind Shannon Payne’s third-place finish at the 2008 championships. The UCCS women finished No. 11 in the team standings in the best performance since 2012. Hannah Ellis placed No. 104, Katie Novak in No. 123, Natalie Church in No. 132 and Marah Guzman in No. 150 as the five scoring runners. Afeworki Zeru finished No. 43 overall, three spots out of All-America honors, as he led the men to a No. 12 national finish. He crossed the finish line for the 10-kilometer race in 33:36.1. Zeru and Tim Howley (No. 88), Willie Moore (No. 90), Sam Nofziger (No. 95) and Mark Simmons (No. 110) provided the five scoring runners for the Mountain Lions in their best team finish since 2012. Congrats on a great season for both men’s and women’s teams!